In the wake of some recent archival projects, the only son of June Carter and Johnny Cash says there's more unreleased music by his father on the way and that country fans can expect a cavalcade of new music by Loretta Lynn, whom he's been producing of late. In a conversation about the stellar Out Among the Stars, a shelved, early '80s Johnny Cash project that has finally been released by Columbia Records this week, John Carter Cash tells Exclaim! there are other intriguing artifacts that have been collecting dust in his late parents' vault and should soon see the light of day. "My parents were sort of packrats," Carter Cash explains. "They never threw anything away, and all through their time together, they stored away various things in a vault. It was a random collection in some ways. I mean, there were the keys to every city in North America; there was a camel saddle from Saudi Arabia. It was an amazing collection of artifacts and random things but among them, were hundreds of audiotapes, two-inch reels, 24-track tapes, and some mixtapes also. And on these tapes were my parents' life and the history they created together. 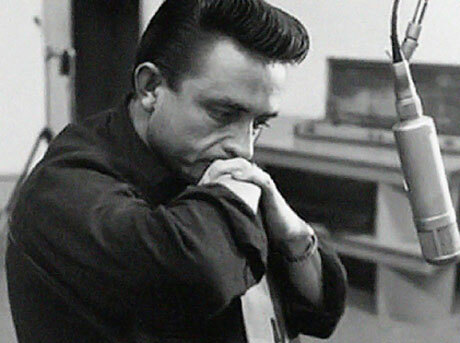 There were the eight-track recordings from the original Johnny Cash Show — just so much there. "And it was within these tapes that we found a lot of great treasures, a lot of beautiful recordings — things that my dad did, just him and a guitar back in the '70s, sort of foreshadowing what he would do later with Rick Rubin. Lots of gospel recordings — there's just so much there. Dad's dedication and spirit to his artistry was chronicled within these finds. I think Columbia knew of these recordings, but they were literally put on the back shelf and forgotten." Among these relics was Out Among the Stars, which Johnny Cash began recording with producer Billy Sherrill in 1981 and concluded in 1984. With only minor touch-ups and overdubs, Carter Cash is proud to have brought the album back to life. "'This is a beautiful record,'" he recalls thinking. "This is something that needs to come out, that people need to hear, that dad would've wanted people to hear." Carter Cash says that Out Among the Stars and the 2006 Bootleg Series compilation Personal File are just the tip of the iceberg when it comes to unreleased works by his iconic father. "The next Bootleg Series may contain more of these recordings that nobody's ever heard that we tucked away. There's a lot there and more stuff that dad recorded with Rick Rubin, so we're really excited to see it all come together." As for Carter Cash, he has his own pressing matters to attend to, including working with one of the queens of country music. "I've been working with Loretta Lynn on some music with her," he says. "I'm really excited about the record that I've done with her. Actually we've done five records and they're sitting in the can. It won't be long until some of those start coming out, one at a time. I'm doing some work with the Orbison estate and there are actually some old recordings that Roy did that will be coming out pretty soon. I'm working with Alex, Roy Jr., and Wesley — Roy's boys — on that. I have a novel out, Lupus Rex, that I wrote and am excited about that. I'm trying to stay creative." Listen to the complete interview on the Kreative Kontrol with Vish Khanna podcast, which has also been transcribed for your reading pleasure over here.